Having your home foreclosed upon by your mortgage lender is an experience no one ever wishes to have. But what happens if you think the lender foreclosed due to a mistake? Or even worse, due to negligence or fraudulent reasons. If this has happened to you, you may be the victim of wrongful foreclosure. But, what is a wrongful foreclosure, and what can be done to prevent one? Wrongful foreclosures occur when a lender initiates a foreclosure process upon a homeowner when no legal cause exists. Wrongful foreclosures may also occur when a lender initiates a wrongful foreclosure process and then accepts partial payments from a homeowner to cease the foreclosure but instead continues on with the process. An incorrect adjustment to interest rates. A forbearance agreement to which the borrower did not adhere to. Regardless of why a wrongful foreclosure was initiated by a lender, their impacts can be catastrophic for borrowers. Wrongful foreclosures appear on a credit report as a foreclosure, meaning that a borrower’s credit score will be destroyed by the action. Not only that, but a wrongful foreclosure may result in the homeowner losing their property and assets. Beyond these, wrongful foreclosures can take an immense toll on a homeowner’s mental health and emotional state. When it comes to a wrongful foreclosure, it is the borrower who must initiate action against the lender. This action must be taken against the holder of the note, usually the lender, or in the case of a non-judicial foreclosure, against the trustee, arguing that an illegal or fraudulent sale of property under a power of sale contained within a mortgage has occurred. As the act of a wrongful foreclosure can have serious repercussions financially and emotionally on a borrower, damages are available should they prove the foreclosure was wrongful. These damages are assessed on the value of the property, the emotional distress the action had upon the borrower, as well as any punitive damages the court may award against the lender. It should be noted, however, that these damages may only be awarded if the borrower is able to prove that the lender acted improperly or fraudulently. If you have been foreclosed upon by your lender, but feel that their actions are unjust, you should contact an experienced attorney to discuss your case right away. Wrongful foreclosures are no laughing matter – and can have massive implications for your future. Call the Law Offices of Patrick L. Cordero for a free consultation today at (305) 445-4855. This entry was posted in BANKRUPTCY AND FORECLOSURE PROCEEDINGS on October 11, 2018 by wpadmin. Florida has the second highest rate of bankruptcies in the nation. Upwards of 94,800 filings occurred in 2011. Thankfully, that number is less today. There were a total of 15,434 bankruptcy filings in South Florida in 2017. While the number of individuals claiming bankruptcy has decreased, the devastation it may visit upon these individuals has not. One of the most common fears, and most common results, of an individual declaring bankruptcy is that they lose possession of their home. Thankfully, there is something called Mortgage Modification Mediation (MMM). As the largest consumer bankruptcy filing firm in Florida, we know a thing or two about using Mortgage Modification Mediation programs to help you keep your house. Check out our guide below. Do not hesitate to contact us today so we can help you keep possession of your home. What is Mortgage Modification Mediation (MMM)? Mortgage Modification Mediation is a process by which homeowners can negotiate to keep their house after declaring bankruptcy. It involves a court-appointed mediator working with the individual filings bankruptcy and their attorney to come to a modified mortgage agreement. It is important to note here that any agreement reached must be signed by the Bankruptcy Court before it becomes enforceable. A few other MMM caveats exist. These include: the debtor having a regular income, and seeking mortgage mediation on their primary residence. 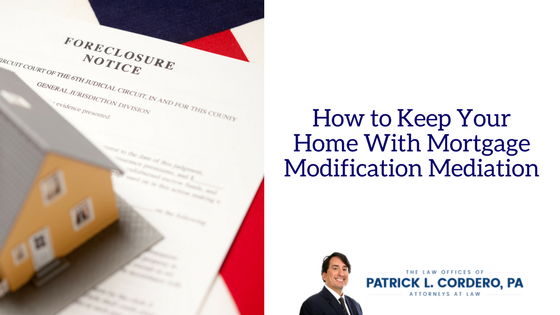 The MMM process begins when the debtor files a motion to engage in Mortgage Modification Mediation within ninety days of declaring bankruptcy. The mortgage lender then has fourteen days to contest this motion. The court will reconsider and, if they decide to allow the individual filings bankruptcy to continue MMM, will appoint a mediator. This mediator will then work with the debtor, their foreclosure attorney, and the lenders to come to an agreement. This agreement must be reached within 150 days, unless both sides agree to an extension. The modified mortgage can take on different forms, including: lowered monthly payments, reduced interest rates, extending the length of the loan, and more. After the individual files for bankruptcy, their attorney and the mediator come to an agreement, where the modified mortgage is brought before the Bankruptcy Court. The court can choose to approve it or not. There are other options, including filings for Chapter 13 bankruptcy, if the court does not approve the modification. Should You File for Mortgage Modification Mediation? There is not a single answer to this question. Rather than saying yes or no, you should ask yourself if MMM makes sense in your current situation. First and foremost, you must meet the criteria to file for modification mediation. If you do meet the criteria, then it is wise to consider whether you will be able to make modified payments. If you have declared bankruptcy because you have lost your job or source of income, for example, it may not make sense to apply for MMM. If, on the other hand, you have experienced temporary hardship but still have a source of income, then it may make sense to file for MMM. Again, the answer will largely depend on your individual situation. If you would like a personalized review of your options, call us today at 305-445-4855 for a free consultation. We will review your situation and offer smart, actionable advice. This entry was posted in BANKRUPTCY AND FORECLOSURE PROCEEDINGS on December 11, 2017 by wpadmin. The median sale price of single family homes in Miami-Dade rose 9.7% over the last year. The total dollar volume of single family homes sold in October 2017 exceeded $481 million. The number of pending listings fell more than 15%. The median time to contract was less than fifty days in October. These statistics all tell different parts of the same story: the housing market in South Florida is unlike many other markets in the country. It is hypercompetitive and poised for further growth. As experienced South Florida real estate attorneys, our job is to guide you through the local market and help you understand what makes our area unique. To that end, we have put together a list of the top four facts you need to know about the South Florida market. Read on to learn important information and do not hesitate to contact us today for a free real estate consultation. The very first thing you need to know is that the South Florida housing market is on fire. Prices are on the rise, the number of homes is limited, homes are going to contract quicker and quicker, and sellers have their choice of buyers. These factors all conspire to make the housing market ultra-competitive. It is certainly a busy time. This brings us to the next fact about the market: it is firmly controlled by sellers. A seller’s market is when demand for homes is high, prices are high, and sellers can be selective about who they sell their property to. South Florida has been considered a seller’s market for some time now. This is due to a number of factors, including the location, the wonderful weather, the business landscape, and much more. Things become more complicated when we consider the different markets within the larger housing market. The single-family home market is a seller’s market. The multi family home market, meanwhile, fluctuates between a buyer and seller’s market. The luxury market, on the other hand, is a buyer’s market. The luxury market is defined as the housing market for properties over $1 million. While this luxury market may be smaller in a place like Nebraska, it is huge in South Florida. A quick property search returns well over 750 luxury listings for the City of Miami alone. This number increases exponentially when considering Broward and Palm Beach counties. The South Florida luxury market is a buyer’s market for a number of reasons. Some of these are simple to understand. Luxury property is expensive. Not everyone can afford it and there are simply more sellers than there are buyers. This puts the power in the hands of the buyers. There are other reasons as well, like the decline in international investment in South Florida. The final piece of information you need to know about the market here is that construction is on the rise. This is a natural response to increased demand. The more people that want homes, the more homes that will be built. As construction of both single family and multifamily homes increases, we may see this seller’s market begin to change to a buyer’s market. Only time will tell. Contact us today for a free real estate consultation and to learn why we are South Florida’s largest foreclosure bankruptcy filing firm. This entry was posted in BANKRUPTCY AND FORECLOSURE PROCEEDINGS, BLOG on October 27, 2017 by wpadmin. Many Florida residents are in a financial crisis. Our posts have focused on the increase of bankruptcy filings in seniors and other residents, and we have discussed the rise in foreclosures and people facing foreclosure. According to an article published by The Wall Street Journal, Florida has the highest U.S. foreclosure rate. Almost 25 percent of the mortgages held in Florida are 30 days or more delinquent. The Mortgage Bankers Association reported that the national average in mortgage delinquency is only 13.8 percent. However, Florida residents may see some changes that could improve their financial situation. Fannie Mae has started a new foreclosure-prevention program in Florida that aids the negotiation process between borrowers and lenders regarding mortgage modifications. The program focuses on getting lenders to meet with borrowers who are struggling financially. The key is to get the parties together to discuss mortgage modifications earlier on when an alternative to foreclosure is still possible. Mediations are organized by the Collins Center for Public Policy, which is a non-profit based in Miami. The organization is currently running meditations in six of the state’s 20 judicial circuits. Although many states have adopted laws that require lenders to meet with troubled borrowers, the timeframe for a scheduled meeting could be up to eight months. By this time, the borrower is so behind in payments that a modification of mortgage is no longer a valid option. In most cases, foreclosures have already been filed with the court. The Collins Center has been able to get lenders and borrowers together for negotiations within four months of becoming delinquent on mortgage payments. When the process is sped up, borrowers have an opportunity to meet with lenders before a foreclosure is filed. Homeowners have a better chance of saving their home by working out a modification agreement with lenders. Currently, only borrowers with a loan owned or guaranteed by Fannie Mae can participate in the program. Freddie Mac does plan to implement a similar program in Florida, but it is not certain when the program would start. Florida bankruptcy attorneys can also assist struggling homeowners with finding solutions to avoid foreclosure by seeking out a mortgage modification. Bankruptcy lawyers understand the foreclosure process, and they can educate Florida homeowners about all of the options that could help them save their home. This entry was posted in BANKRUPTCY AND FORECLOSURE PROCEEDINGS on October 3, 2017 by wpadmin. Earlier this month, the Supreme Judicial Court of Massachusetts made a unanimous ruling that two home foreclosures in Massachusetts were invalid. Both foreclosures took place in 2007 when the homes were seized by Wells Fargo & Co. and US Bancorp. According to the high court’s decision this month, the lenders had failed to provide legal documentation proving that each lender held the title to the home that was foreclosed upon. Toward the end of 2010, dozens of lenders were required to put foreclosureson hold as attorneys general began to question the validity of lenders’ legal processes for proceeding with foreclosures. Hundreds of cases were turning up with improperly filed documents and complaints from consumers. Many states are reviewing similar cases, which could affect the foreclosure process in Florida and across the U.S. In the two foreclosure cases presented to the Massachusetts high court, the banks failed to provide documentation that proved the homeowners’ mortgages were held with Wells Fargo and US Bancorp. When an individual takes out a mortgage, the mortgage is often sold to other lenders over the course of the loan. Both mortgages of the homes in Massachusetts were sold and transferred to other lenders, ultimately landing in the hands of Wells Fargo and U.S. Bancorp. However, the title work for the mortgages were never properly updated and filed throughout the string of transactions, and the current lenders’ names were not on the properties’ titles. Because the lenders did not legally document their ownership of the mortgages, the court ruled that the foreclosures were invalid. Many analysts believe that the Massachusetts ruling could affect foreclosure proceedings throughout 2011. Many argue that similar cases may come forth in other state courts. One real estate attorney explained that the ruling in Massachusetts “will be certainly cited as persuasive authority by anybody in a similar scenario who’s trying to hold onto his home.” The foreclosure process could slow down considerably nationwide if banks can’t prove that they own mortgages they are foreclosing on, and homeowners may have a second chance at getting their homes back. Although many individuals in Florida are losing their homes to foreclosure because they can no longer afford to make their monthly mortgage payments, others are choosing to default for a completely different reason. The CBS News reported at the end of January that more millionaires are making the decision to not make payments on their mortgages because their luxury homes have become just another bad investment in today’s economy. Foreclosures in Florida significantly increased last year, and the U.S. reported a record of 3.8 million foreclosures for 2010. RealtyTrac believes that those numbers will continue to rise throughout 2011 as home values plummet even more. Analysts also predict that more millionaires will default on mortgages in 2011 because their homes have lost hundreds of thousands of dollars in value. One luxury homeowner interviewed by CBS said that he originally purchased his house for $1.385 million in 2006. His monthly mortgage payment is $10,000, but now the house is worth less than $800,000. The man said he has not paid his mortgage for over two years now because it is a strategic move for him not to invest in the home anymore. He has already lost over $600,000 in value on the home. According to CBS, one in seven homeowners who have a mortgage over $1 million on a home is delinquent on their payment. These million-dollar default mortgages are less likely to go into foreclosure as quickly as other homes do. Banks don’t want to be responsible for the maintenance costs and they are more difficult to sell. The man interviewed by CBS has not made a single payment on his luxury home for over two years, but the bank has yet to begin the foreclosure process. For the majority of Florida residents, losing a home to foreclosure is not just a bad investment gone awry. Many residents want to be able to make their mortgage payments so that they can continue to provide their family with a home. Unfortunately, more and more individuals are finding it difficult to manage their expenses because they have lost income that they counted on. Bankruptcy attorneys in Florida want residents to understand that there are solutions to keep one’s home while also consolidating debt. Foreclosure doesn’t have to be the result. Although our blog mainly focuses on the benefits of Chapter 7 and Chapter 13 bankruptcy protection, today we are going to discuss Borders Group Inc. and the bookseller’s decision to file for Chapter 11 bankruptcy protection. After several attempts to save the business from filing bankruptcy, Borders announced their decision today to file Chapter 11 in the U.S. Bankruptcy Court in Manhattan. The president of Borders Group said, “It has become increasingly clear that in light of the environment of curtailed customer spending…and the company’s lack of liquidity, Borders Group does not have the capital resources it needs to be a viable competitor.” By filing Chapter 11, the bookseller will be able to focus on reorganizing operations and finding ways to access new capital. Part of the reorganization includes closing about 30 percent of the company’s stores nationwide. In total, 16 Borders stores are expected to be shut down in Florida in the next several weeks. Borders is the second-largest bookseller in the U.S., but has had to compete against Internet-only retailers for years. Companies like Amazon.com Inc and digital readers have shifted the focus of consumers to e-books and purchasing used books online for a much cheaper price. The company began to accumulate debt as Borders struggled to compete with online retailers. In efforts to fight the growing debt, the bookseller sold its Paperchase line of stationary for $31.2 million. The company also attempted to work out a deal with GE Capital that would give the company a $550 million secured line of credit. However, Borders could not meet the required benchmarks in order to obtain the credit. Borders began in 1971 as a local used book store in Ann Arbor, Michigan. Since then the company has expanded to 644 stores in the U.S. However, the company made some crucial mistakes along the way that affected their access to online consumers. As of Dec. 25, Borders assets were listed at $1.28 billion and liabilities were listed at $1.29 billion. Individuals are not the only ones pursuing bankruptcy protection. More companies are finding it difficult to compete in today’s economy as debtcontinues to increase. Individuals and companies may fear bankruptcy and what it implies, but many are finding that bankruptcy offers certain benefits they never knew about. Florida bankruptcy attorneys discuss the concerns and questions clients have about bankruptcy so that each client can make a sound and informed decision about filing for bankruptcy protection or not. The suicide of Dave Duerson has been tragic in so many ways. The former Chicago Bears defensive back believed that he was suffering from a degenerative brain disease known to have caused depression and dementia in others. He committed suicide last week in his Miami home and requested that his brain be tested after his death. The former NFL star also had a pending personal bankruptcy case. According to court records, the personal bankruptcy was filed in September with the U.S. Bankruptcy court in the Southern District of Florida. Duerson’s attorney said he was shocked to hear about his client’s suicide, especially since Duerson seemed “extremely upbeat” about his bankruptcy case. The September filing lists Duerson’s assets at $34.6 million and his liabilities at $14.7 million. Although his assets were double the amount of his liabilities, his assets included a $34 million judgment owed to the former Super Bowl champ. However, Duerson had yet to receive payment from the 2004 judgment. Duerson’s ex-wife was also entitled to 30 percent of $34 million judgment. In December, Duerson’s ex-wife claimed that the former NFL player was attempting to hide some of his assets including two Super Bowl rings and a trophy he won in 1987 for being honored as Walter Payton Man of the Year. Although the filed adversary proceeding did slow the bankruptcy case down, Duerson and his ex were settling the dispute. Duerson explained that the items were not listed as assets in the bankruptcy because the items were listed as assets under the Dave Duerson Foundation. The rings and trophy are supposed to be used for display in a sports hall of fame. A recent article published by the St. Petersburg Times reiterates the fact that although bankruptcies and foreclosures have actually decreased in Florida the past couple of months, the worst may not be over. Earlier this month, our blog discussed how foreclosures were at a 3 ½-year low in January, but economists warned consumers about interpreting the numbers too positively. After last fall’s debacle concerning robo-signing and other questionable foreclosure practices of banks and lenders, the foreclosure process was put on hold for many cases while practices were reviewed. Now many are expecting bankruptcies to rise once again in Florida as foreclosures pick up after banks and lenders resolve last fall’s issues. Bankruptcy filings fell nationally during January. Although there were just over 90,000 bankruptcy cases filed across the country last month, it was the first time in over a year that bankruptcy filings did not exceed 100,000. The number of bankruptcy cases filed during January in Tampa fell 21 percent compared to last January’s filings. Unfortunately, the decrease in filings does not suggest that Florida consumers are experiencing any less economic strain; it may mean that the stress has only been temporarily relieved. Many suggest that the decrease in bankruptcies is linked to the foreclosure process being forced to slow down during the end of 2010. Homeowners have been given a little more time before facing foreclosure, relieving the pressure to file bankruptcy. When homeowners fear that they will lose their home to foreclosure, they tend to seek bankruptcy protection in efforts to save their house. Many Florida homeowners do not realize that they can file bankruptcy before they are at risk of foreclosure. While the foreclosure process was slowed down, individuals were only given more time to accumulate debt and default on their accounts even more. Personal bankruptcy lawyers understand the economic stress individuals are dealing with, but they help individuals understand that there are ways to alleviate debt so that consumers can get their finances back on track while possibly keeping their homes. Although our blog primarily focuses on Chapter 7 and Chapter 13 bankruptcies, the Chapter 11 bankruptcy case of Robb & Stucky has been a popular topic of discussion in Florida during these past few weeks. The Fort Meyers-based furniture chain announced in February that the company was filing for Chapter 11 bankruptcy protection. After 96 years of business, the high-end furniture company commented that the downturn in the housing market and the recession has contributed to the company’s decision to file bankruptcy. The company said in statement, “The home furnishing industry has been among the hardest hit by the significant decrease in consumer spending.” Robb & Stucky own 20 stores in Florida and have several other locations out of state in Texas, Arizona and Nevada. When the company filed Chapter 11 last month they were originally hoping to seek a buyer. However, the home furnishings company could not find a buyer and was ordered by a bankruptcy judge to begin the liquidation process of their assets. The liquidation process began last week and inventory estimated to be worth $90 million will be sold at a discount price. The stores will close after the sales are completed. Robb & Stucky listed over $57 million in debt in the bankruptcy filing. In June, the company’s revenue was listed at $139.7 million. However, June’s revenue was drastically less than revenue for 2006 which totaled $273.7 million. The decline in sales has resulted in the company owing 760 employees $1.6 million in wages. The company also owes $118,913 in taxes. Due to the inability to find a buyer and the order to liquidate assets, the Florida-based company notified employees last week that they plan to lay off 178 employees by April 23. Bankruptcy is much more complex for large companies, but Robb & Stucky’s bankruptcy proves once again that the recession is still affecting individuals and businesses. Before letting debt spiral out of control, individuals can seek guidance from a bankruptcy attorney who will review the individual’s financial situation and offer some advice about the benefits of bankruptcy protection.